SEVERAL years ago and even last year we showed how Microsoft was using Novell as a back door for entering the HPC market, which is overwhelmingly dominated by GNU/Linux. Now, watch how Microsoft is using Novell’s implant for Microsoft (inside Linux) to create an unnecessary dependency on proprietary software. The whole Hyper-V nonsense that Greg K-H has been helping Microsoft advance is finding its way in a Linux-oriented market, leading to Microsoft partnerships and a drift away from software freedom. Novell has been nothing but trouble and SUSE is likely to be equally troublesome. Putting aside Microsoft’s and Novell’s Windows harmony (new YouTube videos), there is clearly some sort of attempt to embed Microsoft (and Microsoft tax) inside GNU/Linux. 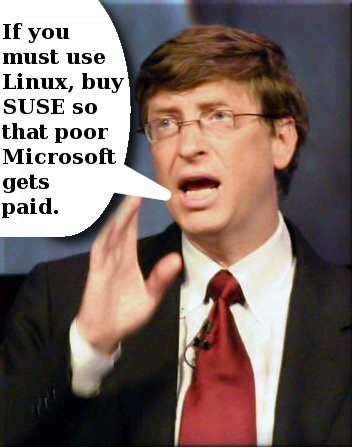 The question remains then, why would anybody choose SUSE over another distribution? And why would anyone attend the OpenSUSE events rather than broader scope events such as the recent one in Berlin? SUSE — like Novell — is like Microsoft inside the GNU/Linux world. It’s only serving itself. Boycott Novell and SUSE.